The onset can be fast and shocking or slow and insidious. It can happen to anyone at any age. A flu, a vaccination, or an infection can be the innocent beginnings to the potentially life-long and disabling illness called myalgic encephalomyelitis (ME), which is more commonly known as chronic fatigue syndrome (CFS) or ME/CFS in North America. In the mid 1980s, the U.S. Centers for Disease Control (CDC) was called in by concerned doctors who were witnessing an influx of patients with a mysterious illness. Eventually the CDC labeled the condition "chronic fatigue syndrome" which turned out to be very misleading. Decades later, in 2016, health agencies are finally beginning to agree with international experts that ME/CFS is a serious, chronic, multi-system illness. 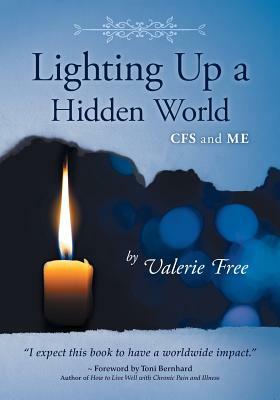 Through artwork, poetry, story-telling, and meticulous research, Lighting Up a Hidden World: CFS and ME takes readers into the fascinating, yet frightening, landscape of ME/CFS. Author Valerie Free shares her personal experiences and delivers illuminating first-hand perspectives from patients, caregivers, journalists, and medical professionals from within the global community in short easy-to-read segments. These stories reveal the disgrace, controversy, and tragedy of worldwide neglect by political and health care systems, leaving ME/CFS research underfunded and millions of people marginalized, sick, and socially unsupported.